Never has a climb been so big in myth and so small in reality. The Koppenberg has a vertical gain of just 62 metres, the height of a large tree but its legend runs so tall. It’s a relative newcomer to the sport and there are riders in Sunday’s Tour of Flanders born before this climb was ever used in a race. The climb is in Melden, a village near Oudenaarde in East Flanders, Belgium. Running east-south-east off the N8 highway it is the Steengat, the “stone way” on many maps. It is 0.6km in length and averages 10% but hits 22%. It is cobbled. Blame Hubert Hoffman, a resident of Melden. It was he who informed the Tour of Flanders race organiser about the hidden track and it was duly included in the 1975 race. But it was known to others before. Walter Goodefroot, winner of the Ronde in 1968 and 1978, used it as a secret training climb. “The Bulldog” used it for practice but told L’Equipe “I didn’t want to have this sort of climb in a race”. I put the history section above because it seems astonishing that this climb could be “missed” by cycling experts for years. The hill is obvious and so is the track, a feature that cannot have changed with time. What has changed is the signage. Today it’s impossible to miss, there are various signs in different fonts, tones and styles pointing to this climb. The approach is typical, you flick right off the main road and the road constricts, passing some tidy brick houses where residents must have soundproofed windows to save them from the endless rattling of chains as cyclists pour forth over the porphry. The buildings end and the climb begins to kick up. It’s been resurfaced and if the cobbles are bone-shaking, they’re evenly so. The best line is on the side where the pavé is laid at 90 degrees meaning elongated stones and fewer bumps per pedal rev. The evil camber from the past has been removed. It’s narrow and almost claustrophobic with the road cut into an embankment. This is the famous part, the scene of a thousand images yet it’s also so short although it’s here that it kicks up, 20% and it’s like riding up a riverbed. The steep banks on the side mean dirt is washed down making the road even more narrow. Onwards and the road opens up, you’ll spot two farm buildings up ahead, they mark the top. Past a brick wall and it’s over, suddenly the smooth tarmac feels like velvet and the only clunk is the sound of your gears as you change up to a better ratio. Was that it? Yes but try to imagine sprinting into the start, someone’s elbow trying to flick you into someone’s front garden and then not being able to choose your line, a 150 second interval on cobbles. Or worse, imagine doing it on a wet day when the cobbles are slippery. I’ve not had this pleasure and can only imagine what it’s like on a damp October day when the leaves are falling off the trees directly onto the road. It can be shaming to walk up a road but this is also one to walk. Image after image has shown riders click-clacking their way up the slope after congestion ahead brought the race to a halt. Trying to restart on the the slope is pointless. If you can pedal to the top of this one, why not turn around and walk just to experience it? First included in 1975 the climb was a hit from the start. It’s hard but the secret is its restrictive, narrow road. Back in the day the stones were worse and robbed momentum even more. Plus a rider had to take a hand off the bars in order change gears on the downtube levers. It meant it was very easy to slow, wobble and even stop on a dry day yet alone if it was climbed in the wet. Consulting the photo archives there are more photos of riders walking up, bikes shouldered, than pedalling. The world’s best cyclists have met their match here but as Jean-Paul Sarte said, “hell is other people” and it’s not necessarily the brutal stonework or the 22% gradient that stops a racer, it’s someone else. One fallen rider means a roadblock and it’s quicker running up. It’s the classic scenario where you need to be at the front to avoid trouble. Everyone knows this but some are too tired to try and so the climb is selective. In a race the top section is exposed and as the road flattens out if there’s a crosswind there’s little shelter. Oudenaarde makes a good base, it’s 75km west of Brussels. If Brussels is the capital and well-appointed with road, rail and air links it’s not a high city of cycling at all, the legends lie outside in Flanders and in the wooded Ardennes of Wallonia. Consequently Brussels probably isn’t the place to stay for a trip to Belgium if you’re cycling. 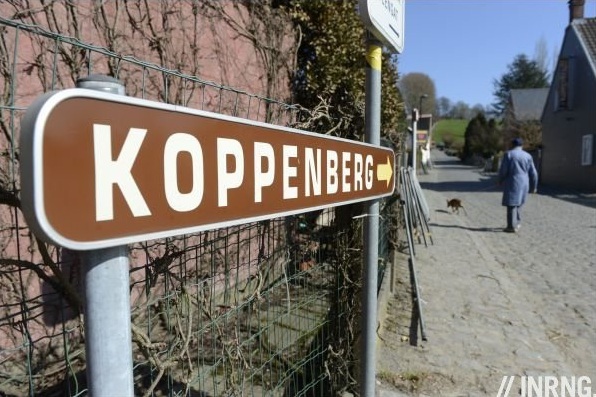 The Koppenberg is just a five kilometre ride out of Oudenaarde this is not a climb to try by itself in the way you might make a day of the Galibier. The Flemish Ardennes are like a crumpled rug, a corrugated landscape full of hellingen or “little ramps” and you can trace a route to include as many of the bergs as you like. For the first-time visitor the proximity of one hill to another is remarkable, the concentration of climbs is impressive and you soon learn what makes De Ronde so intense, it is fine to do one climb but there is little time to recover between each ascent. Oudenaarde is home of the Centrum Ronde van Vlaanderen, the Tour of Flanders museum. 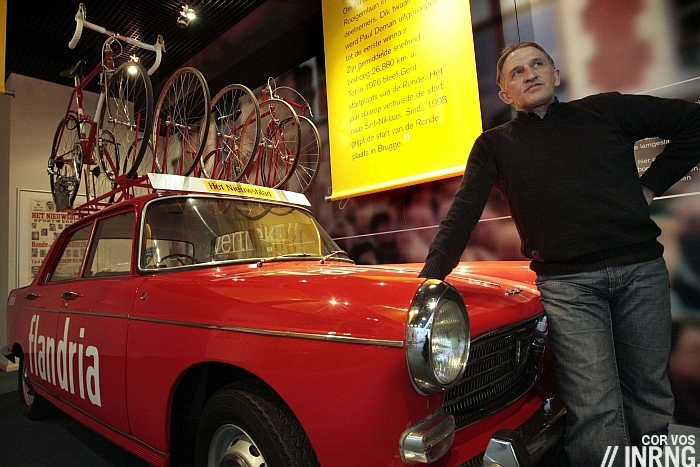 Well worth the visit and you will often spot Freddy Maertens lurking there. He’s part curator, part exhibit. 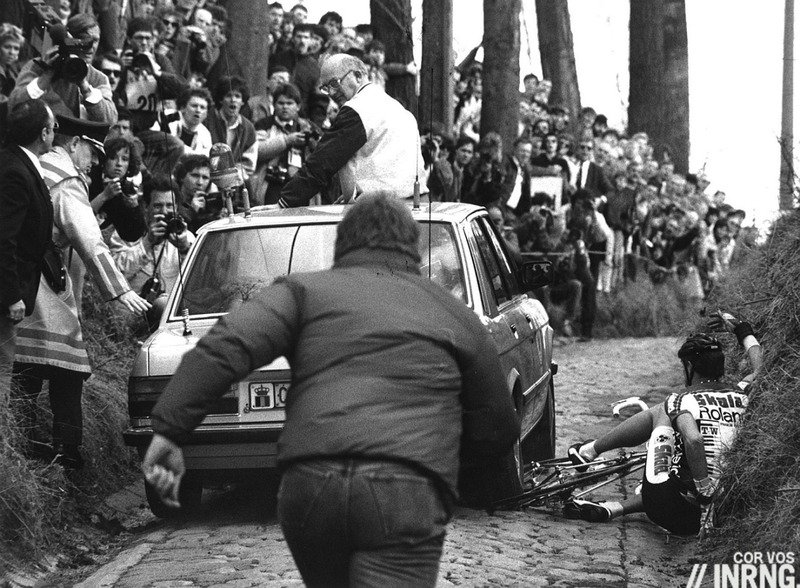 In 1977 Maertens had an illegal bike change during the Ronde. He was disqualified but rode on, fuelled by pride and towed Roger de Vlaeminck to the finish who was the winner. For many Maertens was the “moral winner”, the strongest on the day. He never won De Ronde. The Centrum has a bar and restaurant with themed dishes like Spaghetti Boononaise and Pollo Bettini. Did Cancellara not break a chain on this climb ruining his chances. Seem to remember him walking up showing off the problem? Let’s hope no one has that misfortune tomorrow and we see a great race. You can keep your grand tours, this 4 weeks or so of great classics is the highlight of the year for me. If you’ll excuse me a link, I recently went up a cobbled climb in Britain that’s of similar length and gradient. No-one’s really heard of it though, so all of the pain, but none of the glory. I can recommend my local, cobbled climb – Michaelgate in Lincoln (UK), the centrepiece of the Lincoln Grand Prix and, next year, the UK national road race championships. It may not be the Koppenberg but it’s steep (17%), cobbled and raced on every year – last year Peter Kennaugh destroyed the field in Isle of Man colours. It’s also in the top 100 climbs book, and well worth a look if you’re in these parts. There’s a sportive in May every year which finishes on the climb, and this year a ‘hillchaser’ hill climb competition in the evening. All good fun, and a nice (little) climb in a beautiful medieval city. Ian’t ‘notorious’ seems more appropriate than Andy’s ‘recommend’. I hope they shot that commissaire for going over Jesper Skibby. I read in the latest edition of the Cyclist that it was the race director. He was concerned about the rapidly approaching bunch behind and instructed the driver to drive over Skibby’s wheels. Tough call, eh? Excellent, thanks! All classics fans should try to go there and see this stuff in-person. Spend the loot you might blow on that expensive new bike and instead see and experience something like this. As someone once said, “When you look back upon your life, will you remember the things your bought or the things you DID?” Next year I plan to see L-B-L live, in-person, which will complete the 5 monuments of cycling for me. The stones are relatively smooth and even; you can tell it is much better maintained than before the 80s. I’ll always remember my ride up the Koppenberg. As I was proudly finishing the steep part, a car appeared the opposite direction, and I had to move aside, put me feet on the ground, and finish the damn thing by foot. Gotta go back one day. The Maertens story.. He wasn’t so much fuelled by pride, as by chrematistic promises by De Vlaeminck, no? 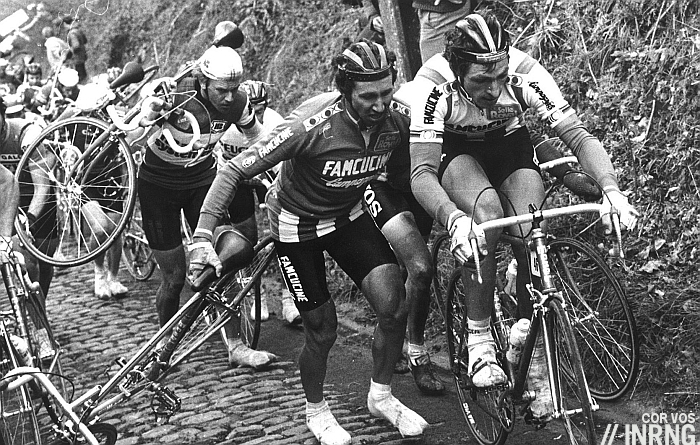 Have done most of the Classics cobbles, and actually love hammering them, even in the wet, but have not yet done the Koppenberg. A relative and fellow racer is moving house to Zottegem in a few weeks, and will go regularly to ride with him in the neighbourhood. Have to remember to ask him to point us in the direction of the Koppenberg! Thanks for the gr8 and informative article Inrng! Seems even more pertinent after the events of Saturday. Enjoyed this on saturday and part walked it as some bloke was in clearly the wrong gear about 20 feet in front of me and toppled over, meaning i had to unclip and walk up the gutter. I genuinely didn’t mind though. its a grand climb that if tackled by yourself in dry weather would be a good test. stay seated as well… i saw one guy try to give it the berries up there and the result was predictable, wheelspin and fall off! Rode it Saturday in the RVV cyclo. Great climb but you are over it before you know what’s happened. It seems to be the narrowness and the scope for congestion which is the key to its fame.